Ottawa–Independent Jewish Voices Canada (IJV) has joined over 35 Jewish organizations worldwide in a statement condemning global attempts to stifle criticism of Israel. From South Africa to Sweden, New Zealand to Germany and Brazil, this is the first time so many Jewish groups have come together to defend Palestinian human rights advocacy from attack. The statement condemns a growing trend of legislative campaigns targeting organizations that support Palestinian rights, particularly those affiliated with the nonviolent Boycott, Divestment and Sanctions (BDS) movement. The United States has increasingly witnessed legislative efforts to criminalize the boycott of illegal Israeli settlements and repress advocacy for Palestinian human rights by defining such acts as antisemitic, with two bills currently under discussion in the US Congress. Such efforts are mirrored at the state level, where more than 25 states have considered or enacted forms of legislation targeting those who advocate for Palestinian rights. Of particular concern is the growing usage of the International Holocaust Remembrance Alliance (IHRA) definition of antisemitism, which is intentionally worded to equate legitimate criticisms of Israel and advocacy for Palestinian rights with antisemitism, as a means to suppress the former. A similar approach is being employed across Europe. In France and Germany, the bank accounts of BDS groups have been closed and people involved in campaigns promoting the boycott of goods from illegal Israeli settlements have been convicted of incitement to hatred. The UK has witnessed ongoing battles over the legality of local government boycotts focused on products from Israeli settlements. The state of Israel is waging its own campaign against advocates of BDS. In January, the Israeli Ministry of Strategic Affairs announced a ban prohibiting the leaders of 20 organizations from around the world from entering Israel, including the US group Jewish Voice for Peace, for supporting BDS. And in 2015, the Israeli High Court upheld a law which allows individuals to sue those who call for the boycott of either Israel or companies profiting from activities located in illegal Israeli settlements. In Canada, legislative attempts to brand Palestinian rights activism as antisemitic go back to 2009 when the widely criticized Canadian Parliamentary Coalition to Combat Anti-Semitism was formed. The Federal government has since adopted a definition of antisemitism that is nearly identical to that of the IHRA and passed a non-binding motion to condemn the BDS movement in 2016. The Ontario legislature followed suit shortly thereafter. 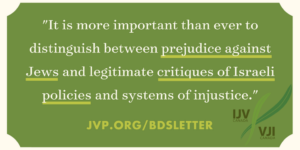 “IJV is proud to be part of a growing chorus of Jewish organizations across the globe that are taking a stand for human rights and against attempts to conflate criticism of Israel with antisemitism,” Balsam concluded.